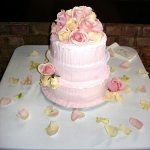 3 tier round cake with soft pink royal icing and fresh rose side sprays and topper. 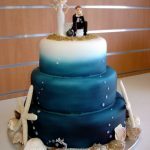 Three tier round cake painted varying shades of blue with starfish and shells adding to the ‘beachy’ feel. 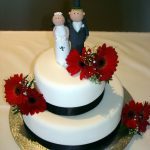 Comical bride and groom topper finish off this fun, unique cake. 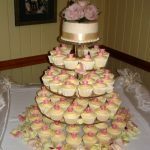 Three tier round cake featuring delicate piped sea themed motifs including seaweed, star fish and bubbles. 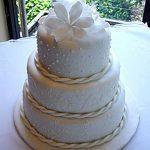 Icing ropes around base of cakes add to the nautical feel, while hand-made icing lilies compliment the beach theme. 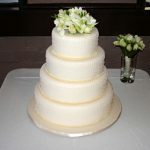 Three tier round cake with top tier elevated. 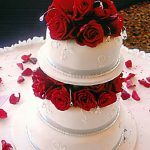 Delicate piped hearts add detail to each tier, while fresh red roses and scattered crystals make this cake stunning. 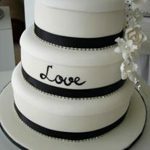 Three tier round contemporary style cake in black and white. 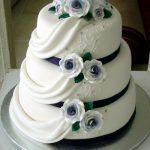 Delicate white icing flowers adorn this cake. 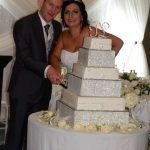 Diamante strings around base of cakes add a touch of bling. 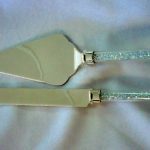 Cake knife and server set with clear acrylic crystals in handles, silver plated blades. Approximate dimensions knife 30cm long, server 25cm long.